This is truly something different. For several weeks I have been slowly drip feeding updates about the fact that organisations across London are waking up to cycling. What's happening now is that the support is turning into a flood. It started a couple of months ago. 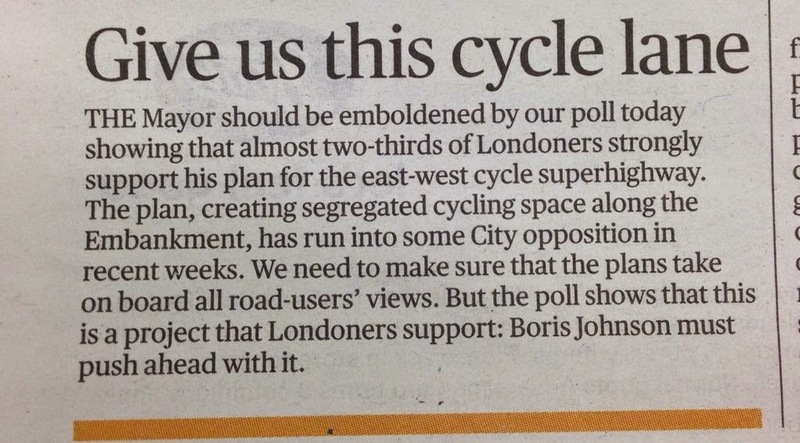 I first got a whiff that some organisations were trying very hard to undermine the Mayor's plans to build two cycle super highways in central London. Days later I was contacted by the people behind a pop-up group: Cycling Works London. 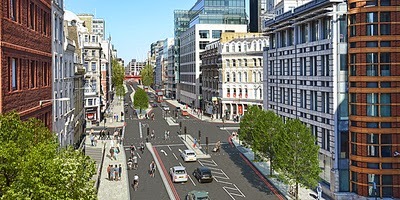 The purpose of the group was that a bunch of like-minded individuals would spend their time asking their employers and some clients whether they would be prepared to write to Transport for London in support of the Cycle Super Highway plans. Those people were Chris and Jono Kenyon, Nick Kocharhook and Dr Tabitha Tanqueray. And now including me and also Mark of ibikelondon blog. There's one other key individual too but I don't know if he wants me to mention him in public, so can I think him in private for now. We started rather timidly and managed to get a few companies to put their name forward. These were all people that we knew but not necessarily people who regard themselves as 'cyclists'. Just people who felt that their employees deserved a better deal on bikes on London roads. The first signs that we were getting somewhere came when other people started to get in touch. Before we knew it, the big accounting firm Deloitte was writing to support the plans, encouraging its partners and staff to write in as well. Then came various other professional services firms - law firms Allen & Overy, Nabarros, Charles Russell & HerbertSmith Freehills. Little by little, all sorts of other industries came out in support. So, we have almost everyone who's anyone in the London property scene (the exception being Canary Wharf Group). It started with JonesLang LaSalle, then came KnightFrank, then Barratt Homes, Argent (big developers of the Kings Cross area), DTZ, Land Securities, GVA Grimley. And plenty more. And fairly speedily, the consumer brands came along too. Unilever, Orange, Hovis (yes the bread), Coca Cola and some retailers including Borough Market''s Cannon & Cannon and Sofa.com (plus one very large one coming that I can't mention yet). Then came a clutch of tech firms, boosted by a stonking letter from the CEO of Microsoft UK and from ARM Holdings. A whole host of firms based in Canary Wharf also came forward. The banks - Royal Bank of Scotland and just overnight Rothschild Bank. They are joined by an array of theatres - Royal Opera House, Shakespeare's Globe, the Young Vic all of whom said this would boost audiences and improve things for their staff and performers. The actors' trade union Equity wrote in last night as well. And a particular shout-out for Cemex, the construction company - who have been extremely vocal about their support. in the last six months. As it might soon look. In fact, no fewer than 43 organisations have written in over the past 48 hours. It is truly mind-blowing. The Dean of Southwark Cathedral has written in support, Canon Giles Godard of the Church of England parish of Waterloo, St John with St Andrew has written in on behalf of his parish, which covers the south bank between Blackfriars and St George's Circus. Even the Institute of Physics has come out in support. And from the Universities - the students union of the University of the Arts (25,000 students), the acting principal of Queen Mary University, the University of Westminster (and we believe UCL as well). Organisations as diverse as the British Veterinary Association and the London School of Hygiene & Tropical Medicine have also played their part. They've been backed by none other than the CEO of the Financial Times and strong editorial leads in The Evening Standard. Publishers Simon & Schuster were early supporters and joined more recently by Penguin Random House. And on a more sombre but equally impressive scale, all of the major London trauma centres have written in support. The CEOs representing London's big hospitals (Barts, Imperial and Kings NHS Trusts) have all swung behind this. Alongside them, City Police - the police force for the Square Mile - has issued a statement in support. They join the London Air Ambulance and the Association of Anaesthetists. We know of over 160 organisations and I haven't managed to mention even half of them on this list. We also know of many more organisations that have written in support but didn't want to go particularly public about it. The most fascinating thing has been people's reactions. The companies that have got behind this have all said that their staff absolutely love them for doing this. I think that's very significant. I said it at the top of this blog post. And I'll say it again. I - and I think we - are truly humbled. What started as a small group of people nervously asking our employers if they'd back this Cycle Super Highway stuff has snowballed. And to each and every one of those employers, thank you. I spoke with some people at Transport for London last week. They have never, as far as I understand it, had as much public support in a consultation as they've had from all of you. The consultations run until Sunday this week. If you haven't already, please add your voice. Either as an individual or on behalf of an organisation. Heres's what you can do to help. I can't really add to that. Thank you. And in particular thank you to the Cycling Works team. It was their idea to pick this up and run with it. They've been out flyering. We've all been out planning and getting on with it. Just amazing.